“When you become a mother, half of your personality goes away,” a friend once told me. She assured me it does come back, but in those early years, it’s incredibly easy to lose oneself. I immediately understood what she was saying. I, too, had lost myself in the daily chaos of being a mom. I felt like I had lost a part of me that I was dying to get back. I was feeling disconnected… like I had absolutely no space in the house I could call mine. Both of my boys had their own room. Even my husband had his own office… but not me. As the person busy running around taking care of everyone else, where was my own place of refuge to try and recuperate from the day? As moms, it’s so easy to lose ourself in the family and house that we forget we are independent people who need, even yearn, for a space of our own. We need to remember that we are not just mothers and wives and household managers but full-fledged women. Virginia Wolf once made the argument that all women need a room of one’s own (affiliate) if they were going to be successful writers. But I argue that all women need a room of their own, period. Three years ago I decided the one way I could actually crawl back into feeling more of a human again was to find a space I could call my own, and it was one of the smartest decisions I could have made. Before I reached this conclusion, our sunroom was a play space for the kids. We had a mini slide and the children’s toys in there. Sunlight would stream through the window and it was an enjoyable place to spend time. But as the kids hit the later toddler years, having the room as a playroom wasn’t quite so important. They began to take over the family room and work their way into the basement play area. I saw my opportunity and claimed our sunroom to be my space. I kicked the family out of the sun room and made it mine. It is my refuge. My place to enjoy the sun. My place to curl up on the mini couch and enjoy the fireplace. Even if you don’t have this kind of space for yourself…. find ONE PLACE in the house that is ALL YOURS. It doesn’t have to be big. It doesn’t have to be a room. But it should belong to you and only you. And have the family honor that space as yours… where you can reset, refill your tank and get ready to take on the world. Even if it’s just a place where you can put your papers and know they won’t be touched. Even if it’s just a sitting chair where you can read for 10 minutes. It doesn’t matter… but it should be YOURS and yours alone. My children understand that this room isn’t theirs. They are invited to spend time here by me. And trust me, I do invite them. Recently on a cold, rainy weekend, I invited to boys to come hang out in my space, promising a fire in the fireplace, board games, snacks and my undivided attention. From their perspective, it’s a special time to just hang with me. 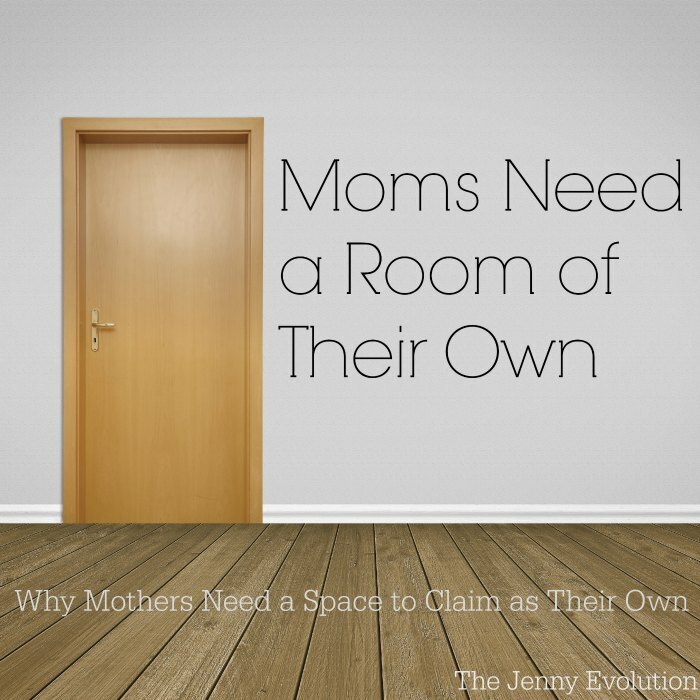 I know it may sound strange, but having my own space really did make me a better mom. It allowed me to feel like an individual person again. I can go into my sun room (which we call the green room because of the gardening green carpeting with white diamonds) and have my own cocoon. A place that I can recharge. I place that I can exercise my brain. It’s also important for me to have my boys understand that I am my own person with my own thoughts. Having this room and having them learn how to respect my space is key in them learning that I am not just here to serve the family. And yes, there are lots of things that go into that — but trust me, having my own space was a physical indication of the fact that I have my own things going on outside of their daily needs. As moms, we’re usually too busy taking care of everyone else. Isn’t it time to take care of yourself? TELL ME: Do you have a space to call your own? Oh my gosh, YES! SO MUCH YES! I DON’T have a place of my own in the house and it’s been a constant source of upset for me (even our bathroom is part of the bedroom, so if I want to try to reset in a bubble bath, I’m still not ALONE. There’s a curtain, but I’m still right in the room with my husband, essentially). I’ve definitely wished we could just add a tiny extra room to the house we rent so I could have somewhere to put my things, but for now I’m just at a loss :\ But after reading this it’ll definitely be on my mind again and maybe I can come up with something creative this time! I started small, Carolyn. It was a corner of the bedroom that I put a really nice chair, a beat up side table and a lamp. It was a place my husband was forbidden (and I mean FORBIDDEN) to dump any of his stuff — no clothes, books, etc. And I would let him know when I was going into our bedroom that I would like some time by myself… a key point. It’s okay to kick your hubby out of the room for your own sanity. It’s a closet…but it’s all mine! This is so very, very true. As moms we often forget ourselves and run our own wells dry. I recently reordered my priorities to include time for me to pursue my own interests as well as moving my desk into our bedroom and claiming that area of the room as mnie and mine only. It really does help even though it isn’t a full room. No one can put their things on my desk, no one uses it but me unless I ask them to do so. It’s amazing how much those little things have brightened my days. It really is amazing how making just a small change can have such a big impact. Good for you for seeing that you really needed a desk space dedicated just for you! So so true – my kids are young adults – but I still need space and alone time!!!!!! You made wonderful and truthful points!!! Thanks, Clare. And I have to imagine the need for your own space doesn’t stop when your kids get older! I’m just starting thinking about this very idea because finally with the kids moved out we have room. I don’t know if I could have used it when they were young. I would have been worried what they were up to while I was in my special room. LOL! I still can hear what’s going on… but I know what you mean. When the house is quiet… the kids have to be up to no good 😀 But now that the kids are out, I hope you’re able to claim some space for yourself. We just moved house and I *finally* have my own room. I *love* it. Really really REALLY love it! Yeah! It’s amazing what having your own space can do for your soul, right? Oh you are SO right. I have no space of my own and it drives me nuts. This is a great reminder to all Mom’s for sure. I am feeling like I need this more than ever these days with my husband and I and our 4 kids living in a 2 bedroom apartment after losing our home of 12 years. We are in the midst of diagnosing our youngest with Aspergers and sensory issues and struggling financially to provide. Stress definitely sets in and my husband and I haven’t had our own space as a couple for 2 years, let alone a space of our own for us as individuals. Any ideas from anyone in this situation? Melissa — If there’s even a space in your bedroom to claim as yours, do it. It could be a reading chair in the corner with a lamp that you can curl up in. It could be a small vanity with a stool — just some place that is for your stuff alone! I know space can be limited, but for your own sanity, do it if you can. Also, if you haven’t learned about the website The Sensory Spectrum… I run the website as I have two kids with sensory issues. You can find it at http://www.thesensoryspectrum.com. I post tons of great tips to help parents of sensory kids as well as other information for the community. Sounds like you have a lovely set up! I wish I had done that when my kids were small and I was in grad school. We have a storage room that I sometimes daydream about converting to a nice room just for me. What’s stopping you? You can even get the family into the act of cleaning it out and deciding what to keep and what goes! I do have my own space and I absolutely agree. There are times I can just sit in quiet with the door closed and clear my head. It was our nursery – so when my husband suggested turning it into my “dressing room” I was hesitant to let go of the nursery as it seemed so final. Plus, the rom was so fabulously decorated I loved it!!! The idea of not sharing a closet and having a space to do my hair and makeup (and not hear constantly about my shedding all over the bathroom) was sounding better and better. After much work (his idea – all my work?! What the heck?) I had a room I could decorate how I wanted, maintain how I wanted, store as much or as little as I wanted and it was just for me. Now that my daughter is 13, I have to remind her that it’s my room and if she is planning to pilfer through my jewelry, scarves, socks, etc – to ask first! The idea of a deadbolt lock has crossed my mind many times!! I completely agree with this concept. I wish I had room to do this, but with seven kids, I just don’t. The shower is “my place” most times, and I am also lucky to get out of the house five days a week for an hour or so to go to the gym. This is “me” time that happens no matter what for the same reasons you spoke of. Thank you for encouraging moms! Working out is a great “me” time for a lot of moms. The shower still isn’t a private space for me. I feel like every time I get in, someone needs something. Ha! I also have a space of my own. It’s in our basement, so I don’t use it very often…yet. I need to clear out the clutter and get to it! Thanks for letting me know I’m not the only one who needs it! Everyone needs it, Shann! If you brighten it up, you won’t feel like you’re “in the basement” but I know what you mean. Thanks for sharing this! I couldn’t agree more! My ingenious Step Mom turned a closet into her own little space. She is an author and truly enjoys this space as her own, her refuge! Goes to show, like you said, the space does not have to be huge, just something to claim as your own. So smart to turn a closet into a space. 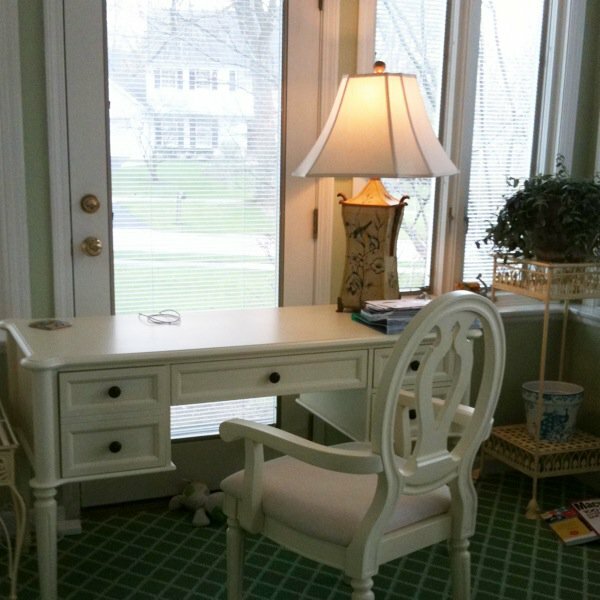 I see family sites that advocate turning a closet into a mini reading room for kids — why not a work space for grown ups! We’re on the road full-time now and I joke that I need a tent of my own as a Mommy Time-Out space. Maybe it shouldn’t be a joke! LOL. If generals of armies get their own tent, why not the general of the family? Ah, yes! The idea of having my own room sounds amazing. There’s no space in our tiny house for me to have a room of my own right now, however just going on a walk or run really helps me. Maybe I don’t have a space of my own, but I can at least clear my thoughts a little and have some time to myself. You can definitely picked up on the trick of finding a way to clear your mind. That’s awesome! Love this post Jenny! We have a covered back porch, but it’s the same temp as outside. Okay in the Spring/Fall and too hot or cold in the Summer and Winter. I have to find a way to make this work! Time to figure out how to close in the porch so you can use it ALL year round! Just find a corner for yourself! I can’t tell you how much difference it makes for your peace of mind…. even if it’s just a shelf where it’s yours and no one is going to mess with it. Make it yours. Oh My WORD! You hit the nail on the head here. I can’t think of any place to make my own other than kicking my hubby’s car out the garage and locking him out hahah. Now you’re on to something! I’ve definitely seen my fair share of people converting their garage into an additional space — why not make it your own? I love this! I fully agree. I recently transformed our study into my Sewing and Crafting room. Mine! It is a truly wonderful space that I’ve decorated all girly. Just. For. Me. It’s kind of a dream come true, really! I’ll be painting it a super bright, girly color soon…and now I have a place for my sewing machines and art supplies. A dedicated space. No more hauling out all the sewing and crafting stuff to the kitchen table and creating havoc. My mind is now free to let the creativity flow and at any given moment, I can take a seat in there and do a little creating in the nooks and crannies of my crazy life with 3 kids! HIGHLY RECOMMEND! It has changed my perspective for the better. And, the kids love seeing me smile and are learning from me in more ways than one. Win. Win. I haven’t added a space just for sewing… but oh my goodness that would change the game for me, too. Often I don’t want to start a project because pulling it all onto the kitchen table is just too much. But I do love having my own office space and reading space… it’s completely changed the game for me. Glad you have your own space, too! Me and my son’s father are separated. For a long time I shared a room with my son till recently I was in a better place and he got his own room. I truly understand why you say it makes you a better mom. Being able to put him to bed and walk away is the greatest. No tripping over toys. No more struggling to sleep because the room is too bright. Because God forbid one of his three night lights needed a new light bulb. It is so important we take a space for ourselves and a few uninterrupted moments. Everyone needs a place to retreat to. I am with you on this one.